That last command is a rather flexible one, though, achieving different things depending on what you drop the coin in front of. 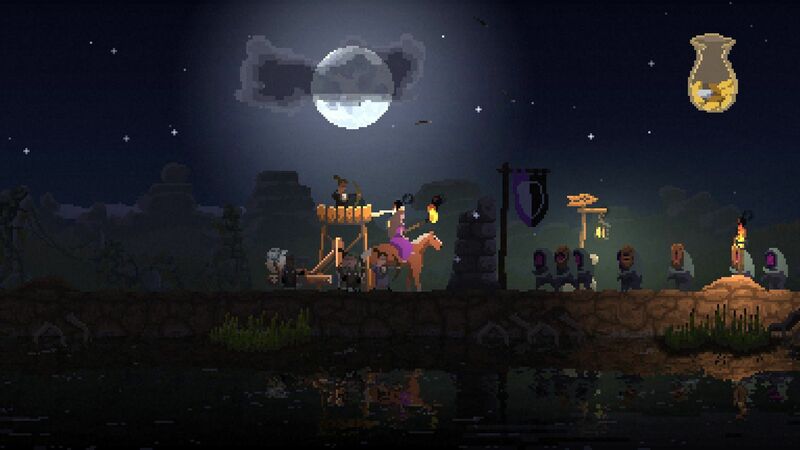 The first thing you do in the game is spend 1 gold in front of the embers of a campfire to light it; this establishes your initial camp and causes market stalls to spring from the ground which sell hammers and bows. Next step is finding somebody to wield them by wandering over to a nearby camp of indigents and dropping some money to convert them into citizens, who will amble back to your camp and equip themselves with whatever you’ve bought. If they pick up a hammer they become builders responsible for constructing the rest of your kingdom, especially walls to keep out the ever-undesirable monsters.. A bow turns them into archers, who are absolutely critical since they both bring in money by hunting rabbits and deer during the day, and defend your kingdom at night by standing behind the walls and pelting attacking monsters with arrows. Walls and other buildings are built by standing in front of a particular hotspot on the terrain – a clump of dirt for walls, a trickling stream for farms, a large rock for watchtowers — and dropping successively larger amounts of money to build and upgrade them. Once built, the buildings will be automatically staffed by your minions with no orders from you necessary. This is the core concept behind Kingdom: that you, the player, have zero control over your minions. They’re instead governed by AI that follows some very basic rules depending on their role, and a large part of Kingdom is figuring out what those rules are, since they are never explictly explained to you. (Indeed, nothing in Kingdom past the basic four controls is explained.) Builders will simply wander around, only becoming “active” when you spend some money to cut down a tree or build a new wall, at which point they’ll sprint to whatever needs doing and do it. Once it’s done they’ll resume their idle behaviour, which is kind of a pain if you’ve just told them to deforest an area a long way outside your kingdom; all your citizens will sprint for the safety of the walls as soon as the sun sets, but if they’re too far away they won’t make it in time and get beaten up by monsters. Archers will prowl the grounds just outside the wall in the daytime, and if there are no rabbits to be found there they won’t do any hunting; your monarch will have to lower themselves to flushing deer from the wilderness into their bowsights. At night they will stand behind the outermost set of walls only and try to hold back the flood of monsters that emerge from portals deep within the woods. By building successive sets of walls further and further out from your castle you can expand the safe limits of your kingdom as the archers will automatically move outwards to catch up once a new set is built. Figuring out this behaviour was what I found to be most fun about Kingdom. It is, when you get down to it, a pretty simple game, but since it tells you nothing it needs to be simple in order for you to be able to discern the rules. It has a dreamlike, idyllic quality about it that’s enhanced by the mystery of how the various bits and pieces fit together, and you won’t get that full picture until you’ve had a few failed attempts. This is something of a two-edged sword, as since you don’t know anything about the game world to start with it is absolutely impossible to plan and you’ll likely get yourself into a situation from which it is impossible to recover. For example, the camps that provide the new recruits for your kingdom will disappear if you cut down the tree nearest to them, forcing you to range further abroad in search of another camp. In my first game I expanded too far and too fast and eradicated nearly all of the recruit camps, and this was a big problem since I’d made far too many builders and not enough archers – and to make matters worse I’d assumed that it would be a good idea to build lots of watchtowers, which archers permanently assign themselves to instead of hunting or defending. The watchtowers don’t move but your outer walls do, so once you’ve built another set of walls beyond wherever your watchtower is it’s effectively useless, wasting both the money you spent on it and the archers who are manning it. This is probably my biggest criticism of Kingdom: that it tries to eke out its running time by rather intentionally preventing you from correcting your mistakes. This gets super-annoying at times when combined with the lack of control, like when you really need archers but because there are still three hammers on the rack of equipment nearest to the recruitment camp – new recruits will simply grab whatever implement is nearest to them, and once a recruit has assigned themselves to a role there’s no way to undo it. That’s how my first game ended – with crowds of idle builders hanging around in front of farmhouses with nothing to do while the undermanned barricades were torn down by a horde of monsters. You won’t ever lose Kingdom, mind — I’m not even sure that it has an outright fail state. You can not win it, though, and once it becomes apparent that you can’t win the only thing to be done is restart. As Kingdom has a running time of probably about two hours from start to finish this is kind of a big ask. The test I’ve applied here for a few years is the Spelunky one, which can be completed in half an hour or less and which is pretty much the perfect length for impulsive play sessions that are entirely disposable in the long run — I never feel insulted when I die in Spelunky. If you go longer than that you risk having starting again feel like too much of an ask, especially since Kingdom’s very light roguelike elements (it randomises the placement of terrain, but there’s not too much it can do with this since its map is just a straight line) mean that you are mostly doing exactly the same things over and over again. Kingdom suffers from a second issue that’s made particularly acute by the first: it makes you play it over and over to learn from your mistakes and figure out the rules, but once you do it turns out the game is just as one-dimensional as its map. It’s got way too many traps that seem to exist for no gameplay purpose other than to catch new players out and make them start again. Once you learn who to recruit, how to expand and what to avoid, it is pathetically easy and completing it by expanding to the point where you can smash down the monster portals is simply a matter of grinding through yet another two-hour play session – and at this point it’s likely you won’t want to since it’s painfully apparent that Kingdom has nothing else to offer. It’s basically the videogame equivalent of a J.J. Abrams TV series: it prides itself on its sense of mystery, on the impression that there’s something deeper going on under the surface, but once you know enough to see past that surface it turns out there’s nothing there and that your desire to play it evaporates at the same time as the mystery does. I’ve avoided talking about the game mechanics beyond the basics because I want to preserve that mystery for you on the off-chance that you do find yourself playing it, so you’ll just have to take my word for it when I tell you that it is not worth it. So yeah, I don’t think Kingdom is very good. For some reason I don’t hate Kingdom the way I do a lot of other poorly-designed games, and I think this is partly because it feels like the sort of thing that might have been released onto the Amiga twenty-five years ago. Still, while some of this is down to the way it looks and sounds — it’s impeccably well-presented throughout — that’s ultimately just another way of saying that it has mechanics that are by turns dated, pointless, poorly-thought out and wilfully obtuse, and sometimes all of the above. I gave it a few hours largely out of that sense of nostalgia and then swiftly moved on to the next game, leaving Kingdom to crumble behind me just as its opening title did with no regrets whatsoever. What a pity. I had my eye on this for quite some time as it seemed like a pretty interesting concept. I’d love to find a game that has this style of gameplay but which is actually fun. I think the game is a really just a one trick pony. It an example of a “strategy game” really functioning as a puzzle. Once you’ve solved the puzzle, there isn’t any reason to play it more. That said – I really enjoyed this game. It took me about 10 hours across many attempts to figure out how to solve it – and I don’t regret my time with it in the least. It was a fun challenge, and pixel art is absolutely amazing and atmospheric (I have an enormous screenshot folder), and there is a sort of beautiful and haunting feeling to the game that I really enjoyed. But once you do finally beat it, there is no real reason to go back to it. But that isn’t so different from many other game story driven games where you generally only play them once. It’s sad that even if you don’t try to attack the game for being to simple it sounds like a humiliation. “Just a puzzle”. I think strategy genre would be a healthier place if everyone didn’t try to make infinitely replayable games like Civilization or next favorite online game of Korea. I that last thing had already killed RTS genre. Which is a fair point, and I think if Kingdom had a satisfying payoff it’d probably be worthwhile in spite of its deliberate obtuseness. Sadly all I felt when I finished it was disappointment; it’s too basic to really support anything else. I think much of your reaction is going to be fundamentally determined by how much you like trial-and-error gameplay. I personally dislike it, especially when you can’t rectify the errors. 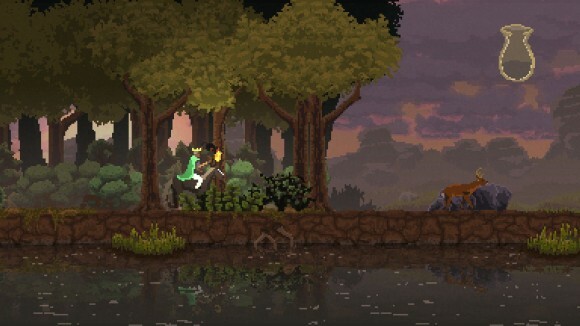 But if you were a little more forgiving of that then I can easily see somebody getting along fine with Kingdom – hell, even I was having a lot of fun on the very first run where I felt like I was figuring things out and making progress. Out of interest, and I appreciate I’m asking this question a little late, how did you feel when you cracked the last of the portals? Like it had all been worthwhile?